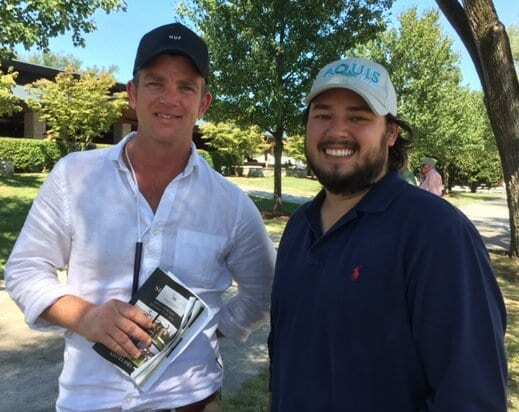 Three colts acquired during the first two sessions of Keeneland's September Yearling Sale – a $250,000 War Front colt and a $180,000 Giant's Causeway colt on Monday and a $500,000 Galileo (IRE) colt on Tuesday – are the first Keeneland purchases for Aquis Farm of Australia. Aquis CEO Justin Fung is in Kentucky for the first time. Fung's father, Tony, is a successful businessman who is a longtime member of the Hong Kong Jockey Club and has become involved in breeding and racing the past few years. The Fung family, who is based in Hong Kong, has developed Aquis into a full-service Thoroughbred breeding and racing operation. Located in Queensland, the nearly 2,000-acre farm is home to some 80 mares, 35 2-year-olds and 35 yearlings and stands four stallions, including shuttle stallion Holy Roman Emperor (IRE). Justin Fung said the three September Sale purchases might remain in the U.S. to race and eventually could join the Aquis stallion roster. The War Front colt, consigned by Warrendale Sales, agent for Stonestreet Bred & Raised, is out of multiple Grade 1 winner Sassy Image, by Broken Vow. Consigned by Eaton Sales, agent, the Giant's Causeway colt is out of the Galileo (IRE) mare Alone (IRE), a full sister to Group 1 winner and Irish highweight Lush Lashes. The Galileo colt, an Irish-bred half-brother to champion Halfbridled, was consigned by Gainesway, agent. Fung, who has an undergraduate degree from Duke University and a law degree from Loyola University in Los Angeles, on Tuesday said he didn't know how long he would remain at the September Sale and whether he would buy more yearlings. He said he is enjoying being at the sale. This entry was posted in People and tagged aquis farm, Horse Racing, keeneland september sale, thoroughbred by Press Release. Bookmark the permalink.